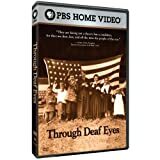 This DVD from PBS includes both the 2 hour documentary originally broadcast on PBS in 2007 and also 6 films by deaf filmmakers that were incorporated in the documentary, a featurette on the making of the documentary, an interview with the director Lawrence Hott, and a collection of historic films related to deaf history. The DVD is an excellent resource for anyone teaching disability studies or wanting to cover deaf culture in any course. The documentary sets out the perspective of deaf people on living with deafness, and relating this to the past two hundred years of the treatment of deaf people. It weaves together historic photographs and movie clips, recent filming of examples of deaf culture, and talking heads (and hands), including some major figures in deaf studies, such as Tom Humphries, Carol Padden, Rosalyn and Jack Gannon, Douglas Baynton, Gina Olivia, and Susan Burch. The documentary covers many aspects of life, such as religion, education, sports, music, race and ethnicity, and arts. It spends some time on the debate over cochlear implants, in a far less incendiary way than the documentary Sound and Fury. It pays particular attention to the controversy over the hiring of Elisabeth Ann Zinser, a hearing person, as president of Galludet University, and the Deaf President Now movement. This is a fascinating film that would work very well in the classroom.